I've never asked a question here and I hope it's a good place to ask this. Someone today asked a question, where I gave a logical answer. Then another person answered and accused me of copying his answer. Please review the edit history to see that the only person who can be accused of copying, is he (he changed the code to match my snippet, but I didn't care until he tried to accuse me.. but we have the edit history). Btw: Obviously, I don't teach user to get the syslogs but to send packed and encrypted logs written by myself, saved into a special file. Anyway, this should not matter. I feel offended and I have no idea what should I do. I don't need to explain myself to annonymous person in the internet when he doesn't try to understand, but it's so unfair. You can and should flag such comments, whether sexist, racist, demeaning, or whatever. The "rude or offensive" flag is definitely appropriate in these instances. To flag a comment, simply hover your mouse to the left of a comment, you will see both a flag and a triangle pointing up. In general though, I would suggest not even engaging further whenever such a comment springs. Simply flagging and moving away is best for you. If there is a repeat history of rude comments from the same user, moderators will get involved and talk with them. Not the answer you're looking for? Browse other questions tagged support comments gender . 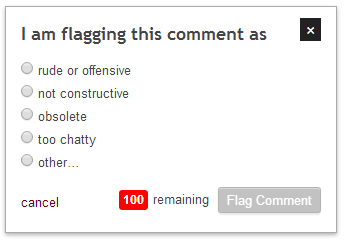 To whom should users who spread consistently unhelpful or derogatory comments be reported?